We have been going to Benenden for over 30 years. Until a few years ago we only travelled by bus, but in the last 10 years we have also been able to offer flight transfers, which many students prefer. However, due to the increasingly stringent security regulations at airports, aviation has become more complicated and time consuming. 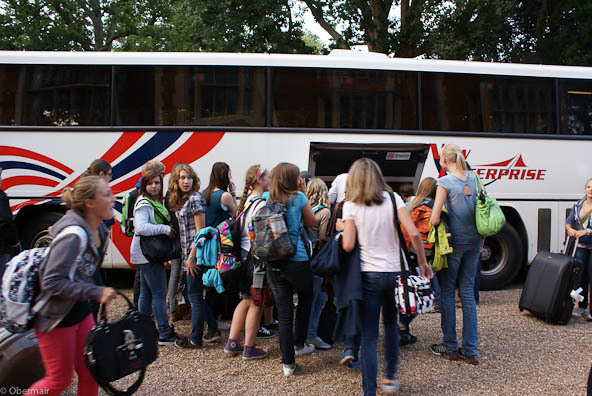 We have therefore improved our on-board services on the buses in order to make bus travel more attractive for the students of the Benenden language camp. The bus journey to Benenden is an adventure in itself and also a lot cheaper than travelling by plane. (Duration: about 15 hours, incl. crossing the English Channel by ferry). Salzburg - Munich - Frankfurt - Cologne - Aachen - Belgium - Calais - Dover - Benenden. We cross the English Channel by ferry. For those students arriving by plane, the course begins a day later and ends a day early! We fly from Vienna, Salzburg, Munich and Memmingen to England. If necessary, we also offer feeder flights from Linz, Graz, Klagenfurt and other airports. Every flight is accompanied by supervisors from the language course, who will meet the students at the departure counter. The tickets will be handed out immediately before check-in and will be collected again afterwards and kept safe until the return flight. The flights to the language courses will be booked in the order that applicatons are received. The exact flight times will be announced with the final information mailing. Register now for the language trip!